I needed to do something to snap me out of this state that i am in today from last nights antics of Mr Tee's Birthday celebrations so thought i would bite the bullet and write my blog of the last two weeks of madness. So where i left off was waiting for the arrival of Sam. The night Sam came to meet me he had booked a hotel for the night in Bangkok in the posh part. The hotel was amazing and a real luxury after sharing mixed dorms for so long. I was so nervous waiting for Sam to arrive it was untrue and when i heard a knock at the door i actually felt my knees give way a little when i got up to answer it. It was so nice seeing him and a few nights were spent in bangkok before flying to Hanoi to start our adventure around Nam. I did love bangkok and the weekend market was out of this world i have never seen so many cool boutique shops i think a stop here will be good on the way back home to get some nice clothes. Arriving in Hanoi was a shock tooihe system in terms of the climate. We have not been use to wearing jeans and jumpers and were suprised at how cold it was. Hanoi is a crazy city though the traffic is unbelieveble and i am told it only gets worse further south. You basically just have to walk into the road and avoid getting hit. Robs top skill is crossing the road and even he got bumped into by a scooter as you can imagine for someone who has been knocked down before and has a fear of roads anyway i had to man up. The days we spent in Hanoi were good, we drank Bia Hoi with the locals at a whopping 20p a glass, went to to Fannys for some ice cream (twice) went to see the water puppets and tried our best to find any food that wasnt noddle soup. The food we found was ok but so far not a patch on thailand. The hotel we stayed in (little hanoi) was great the staff were so friendly and helpfull and made our stay there really enjoyable. From there we booked three trips. The first of the trips was to tam coq (i think i have spelt this wrong) which is where we took a walk up an big hill to admire some scenery, cycled through local villages and high fived the local children on the way and took a boat over the river where a nice lady and her daughther rode us through the river and then treid to make us buy table clothes and other embroided items, Sam buckled and bought a rather fetching bag for his camera. 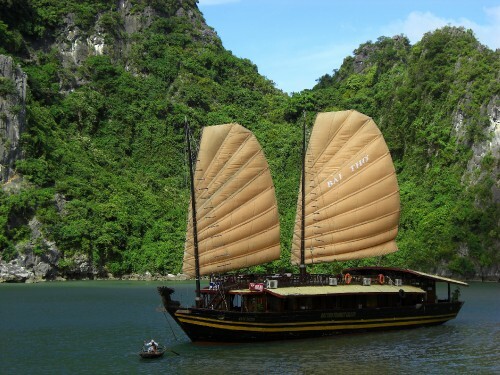 Next stop was Halong bay. We booked a trip for three days two nights and spent a night on a boat and a night on cat ba island. Halong was amzing the only dissapointing thing was the weather which meant we were all a bit cold to go for a swim but managed a nice kayak ride instead. We met some great people on our trip and our tour guide Tony (the tiger) was a legend. After the first day of sailing around the islands the second we went on a bike ride on cat ba national park and stoped off on Monkey island. We were warned before stepping on the island that some of the monkeys (the red faced ones) were a little vicious at times and if one attacked you to sit down and throw sand in its face. I have got to admit i was a little worried i think the last thing i would do if a bloody angry red faced monkey was chasing me would be to sit on the ground. Christina was not in her happy place and as soon as the boat pulled up on the island made a quick dash to the other side where she was safe. Rob however feeling more confident fed the monkeys Oranges and when he ran out one started to climb his bag and bite it, i think Rob handled it well i was fighting every urge not to bolt it. We were then given some time to explore the other side of the Island which was nice as everything on the trip was so cramed at times you just wanted to do your own thing, that night we stayed in a nice hotel in cat ba and all went for a drink with our tour guide tony, it was a great night but my hangover was so bad the next day i was given a blanket on the boat on the way back and went to sleep on the deck whilst everyone else marvelled at the beauty that is Halong. Next stop was Sapa, i have to admit by this point i was feeling sorry for Sam who had come out to relax and not yet had chance to sleep in as everyday we have had to be up stupidly early to do the tours or catch a plane and also with the weather not being great i was worried he would not be having the best of times. We were told that Sapa would be colder and to take some warm clothes but when we arrived the sun was shining. The first day on Sapa we went for a 14km trek with the Local hill tribes women. It was one of the best experiances i have had so far on my travels. Tribes women spoke good english and quizzed us all about our familys back home our age and where we were from whilst making you decorations from Fern and holding your hand whilst crossing rivers. My lady called herself Jane i doubt this was her real name but she was really nice. Walking through the little villages was eye opening, seeing kids run around with no shoes and little clothes covered in dirt and 5 year old girls and boys with there baby siblings strapped to there backs. I did get a bit emotional when we stopped near some children and wished i had brought more to give to them but it was nice to see them enjoy my packet of Oreos so much as they hunglily ate them whilst the eldest sharedthem out. The down side to this trip was what followed. When the tribes women arrive at the village after walking you there they try and sell you everything and do not take no for an answer, i gave Jane a tip but really didnt want a pair of cushion covers or a pencil case. Poor katy came away with a bag full of stuff because she simply found the hard sell too much and couldnt say no. They literaly stand in your face for around 10 mins even when told to go away, this was tiring and really did put a damper on the experiance. The next day me and Sam after being tired of following a strict routine all the time took the day off from trekking and just had a wander around Sapa which was nice and enjoyed some cakes and Baquettes in a cute little bakery thats profits go to local incentives in the community it is also a cooking school for Children. I forgot to mention on the way there we took the Orient Express train where you have your own cabin of 4 and sleep on the train, it was pretty cool. Whilst waiting for the train back to Hanoi we were invited, well Sam was originally (they really are fascinated with his size out here and everywhere we go men feel his arms its so funny) to join a table of locals who gave us free shots of Vodka, the locals are so friendly here. So we then got the overnight train back again and enjoyed some podcasts. We are now in Hoi an where we have been for three nights so far and its been so nice to arrive somewhere again so completely different. Its hot aswell which has pleased Sam and we have spent days by the beach and the pool having some well deserved rest after all the trips and early starts. Hoi an has a tailors every other shop and they will make you anything you want, from suits to shoes. I would have liked to take advantage of this whilst here but think i have left it too late as you need to give them a few days but Rob has had a lovely three piece suit made and i am thinking i may head down tonight and get a LBD done. the food we have experianced here has been so much better especially on the beach where we have had Shrimp, Cockles and Squid. Yesterday i nearly drowned though in a rip in the sea and some Australian guy had to rescue me. I thought i was a strong swimmer and i am confident in the water but this was really frightening and has put me off the sea for a while. I bought him a beer to say thanks for saving my life i was lucky he was there as the guys couldnt see me from where they were sat. Bad times. Sam heads back tomorrow to spend a night in Hanoi before flying to Bangkok then Heathrow and i am a bit emotional about it. Its been so nice seeing him and having fun together and i dont want him to leave. Its also made me miss my Family and friends as i keep thinking about him going back to leeds and it makes me think what is waiting for me. I am having the time of my life and do not want my travles to end but cant wait to see all my family and Friends and look forward to that so much in a few months time. Anyway enough sopppy s*** from me. Me and Rob have had some good news from work which means Rob can extend his travles and stay out with me and Tina. So next stop i think is Saigon then up through Cambodia and Laos. P.S. My Camera broke for while so dont have pics form some of Halong and of Sapa but its decided to work again now so ill upload some pics from Sams camera when he gets back so you can check them out.